For Emily Margarit Mason, the deserts and mountains of New Mexico have a lot in common with the beaches of Florida where she grew up. Her art, in turn, pays homage to both mountain and sky, desert and ocean—the past echoing within the present. Her first solo exhibition in Santa Fe, Shadows Through a Petal, features meditations on place and memory that incorporate digital photography with an overtly physical art-making process. 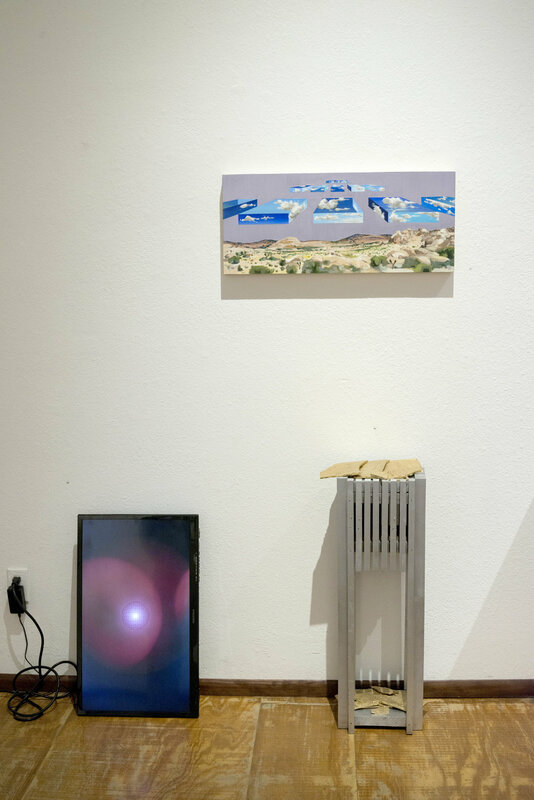 The exhibition goes on view at Strangers Collective’s No Land art space on October 27 and runs through January 13, 2019. Emily Margarit Mason is an artist living and working in New Mexico. She received her B.F.A. from Maryland Institute College of Art. Mason’s work denies realism by accumulating and compressing perspectives, ultimately confusing the assumed monocular lens the camera typically provides. Her work has been shown in Baltimore, New York City, Milwaukee, Kansas City and Santa Fe. She is inspired daily by the light, landscape and magic that surrounds her. No Land is open Saturdays, 12-4 pm. through the run of the show. "This used to be the pit cover for the Lensic, and these are set pieces from a Wise Fool production,” says Damon Griffith, gesturing to the floor and walls of his garage. This colorful bricolage houses the wood and metalworking shop for Flying Wall Studios, a puppet production company that Damon co-directs with his wife Sabrina Griffith. Inside their house, the rest of the studio is a jury-rigged resume for their extensive performing arts background. From their fantastical headquarters, the Griffiths turn out intricately detailed puppets that blur the lines between toy and sculpture. Their new exhibition at Strangers Collective’s No Land art space, The Mechanics of Play, features an exquisite body of work that lands firmly in the latter category. Still, they’ll never abandon their playful roots: the show, which opens Saturday, May 12 from 6 to 9 pm, will feature puppet demonstrations (on Sunday, June 17 and Saturday, June 30) that encourage visitors to interact with the artworks. “If you don’t play with a puppet, it dies,” says Sabrina. Nate Masse, On Polyamory (detail), mixed media, 57.5 x 55″, 2013 - 2018. Kyle Farrell, Alex Gill and Jordan Eddy, co-directors of Strangers Collective and the No Land art space, curate this exhibition of emerging artists and writers at form & concept. 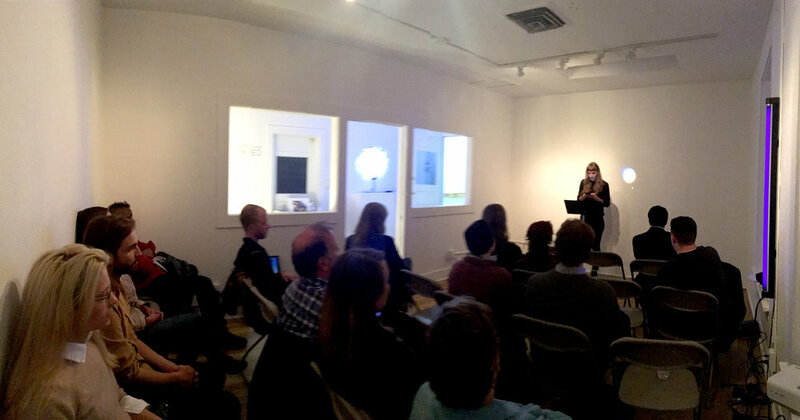 Mirror Box represents a network of early career creatives, starting in Santa Fe and spiraling across the nation. Its curatorial throughline presents a radical method for reflecting on place and identity through art objects. The term “mirror box” originates in the medical field: Vilayanur S. Ramachandran invented the box with two back-to-back mirrors in the center to help amputees manage phantom limb pain. The patient places the “good” limb into one side, and the “residual” limb into the other, making mirrored movements that can trick the brain into believing that it’s moving the phantom limb. “It’s a tribute to the incredible power of grey matter,” says Eddy. “If our minds are capable of conjuring a nervous system from thin air, can we link up with people, places or things in the same visceral but invisible way?” The curatorial team realized that art, like the mirror box, can act as a conduit for this type of transcendent—but also highly tangible—experience. “As we turned over the idea of a ‘mirror box’ in conversation, its meaning evolved to represent a sort of theoretical art object,” says Farrell. “If you imagine a cube made from mirrors floating in a landscape, it reflects you and your surroundings across six different planes. By peering into it, you begin view identity and place in novel ways.” The show’s participants interact with the world in a similar fashion, reflecting, filtering and distorting their varied contexts to create visions of the world that are requisitely imbued with their own experiences. Photographer Emily Mason makes images of her surroundings, collages them onto sculptural props, and photographs the finished assemblages to create images that flicker between dimensionality and abstraction. Painter Nate Masse creates layered figurative compositions that compress visual details from multiple moments into a single, sensuous image. Sculptor Julie Slattery shapes talismanic objects—in this case, enormous bird skulls—that become emotional reliquaries for specific events in her life. “The artworks and zines are mapping out this ‘complete picture’ of an experience,” says Gill. “We’re asserting that fully realized artistic expression can communicate something truer than, say, a hasty smartphone snapshot of a particular person or place.” In an increasingly polarized world, it’s a radical act of empathy to dive through the looking glass. Click here for a preview of Mirror Box on the form & concept blog. Art by Kevin Bond, Emily Mason & Derek Chan. “At the end of the day, I just want to be covered in ink and soil,” Liz Brindley says. This may not be too difficult a feat when you take into account how many hats she wears on a weekly basis: farmer, artist, writer, art educator, printmaker, community organizer. No Land’s next exhibition is Garlic, an artist residency that incorporates all facets of Brindley’s practice as a creator, educator, and cultivator. Opening with an artist reception on Saturday, January 13th from 6-9 pm, Garlic features Brindley’s drawings, prints, a wall-sized mural, and installations of garlic skins, soil, and a kitchen-like space. Through Garlic’s two-month run time, Brindley will host workshops and other events at No Land centered on both art-making and food, hoping to provide spaces for honest dialogue about local agriculture, food justice and creativity. This past fall, right around the time that garlic-planting season was beginning, she discovered The Garlic Testament by local farmer and author Stanley Crawford. She credits this book for awakening a new fascination with the vegetable. As a tribute to it, Brindley and No Land will put out an open call for more used garlic skins, which will be integrated into an installation within the gallery, and later in a paper-making workshop on Thursday, February 8th that will incorporate the skins into the fiber of the paper. Central to Brindley’s practice is her background in education. Her recently developed printmaking workshops – which she’s developed this spring and turned into her own business, Prints & Plants – involve the printing of cross-sections of produce found at the Santa Fe Farmers’ Market. Brindley will direct a similar workshop at No Land on Saturday, January 27th. Learn the process of relief printmaking in this hands-on workshop where you will learn to carve your own veggie-inspired stamp and create a series of prints to take home. Learn how to make paper using recycled materials and garlic skins! The paper we create will be used as recipe cards to take home and give away at the "Garlic" Closing Reception. Garlic. The foundation of any nourishing meal. The ubiquitous nature of this produce shadows the time and energy required for its growth. One clove planted in the fall hibernates beneath frozen ground for seven to nine months to create a head of ten, maybe fifteen, cloves. Compare this to a single tomato seed that takes approximately three months to produce fruit that, when cut open, can provide hundreds of seeds. Garlic takes its time. It makes us wait. It teaches us patience and serves as a mirror for how to move inward in our own lives, shed old layers, and grow ourselves. Garlic shares the quiet beauty of this essential veggie through the spaciousness that comes with waiting to create moments of peaceful reflection and faith. Can we dive deep to ask ourselves who we truly are and who we are becoming? Can we rest into the discomfort of unknowns until they become comfortable? Can we slow down to trust that, after all of the silence, harvest will come and with it, answers? Liz Brindley is a Santa Fe printmaker and illustrator who makes artwork about food to increase awareness of the interconnection of humans and the land. Liz owns and operates Prints & Plants, a mobile art and ecology workshop that travels around New Mexico to teach about local agriculture through printmaking and drawing activities. Liz received her BA in Studio Art and Art History at St. Olaf College in Northfield, Minnesota in 2015. She went on to participate in an Emerging Artist Residency at St. Olaf where she focused on ecologically-centered participatory and performance art. She moved to Santa Fe in 2016 after dreaming of living here since she was a kid. In Santa Fe, her artwork has been shown at Warehouse 21, Show Pony, and numerous pop-up markets. An echo is a fragment of the past, but also a new moment in the present. This fall, Strangers Collective orchestrates a chorus of contemporary reflections at the CCA Cinematheque Lobby Gallery. The local arts group is excited to announce Long Echo, an exhibition of emerging artists and writers that is designed to send ripples through Santa Fe’s creative landscape. The show opens Friday, October 28 from 5-8 pm, and features a series of gatherings that will challenge visitors to rethink the role of emerging visual art, writing, music and dance in the broader community. Long Echo runs through January 15, 2017. In addition to the opening reception in late October, Strangers Collective will host a series of events titled Echo Chamber during the 11-week run of the show. These will include a series of performance installations, a panel discussion and a round table gathering. “The events challenge audiences to participate, and to experience the art in visceral ways,” says CCA visual arts curator Angie Rizzo. “Strangers Collective is asking the community to join them in reimagining what an art show can accomplish.” Long Echo aims to foster new links in the creative community that reverberate long after the exhibition’s closing date. Participating artists include Ona Yopack, Sarah Palmeri, Dion Valdez, Drew MC, Alex Gill, Kyle Farrell, Marcus Zuniga, Florence Cunningham, David O’Brien, Austin Eichelberger, Ben Putnam and Stephanie Thompson. Participating writers include Bucket Siler, Katie Johnson, Acacia Ryan Barnett, Sarah Weisberg, Jordan Eddy, Daniel Bonhorst, Elliot Jackson, Juro Gagne, Kendyll Gross, Ariana Lombardi, Kelly Skeen, Max Walukas and Shannon Latham. Emmaly Wiederholt and Tara Khozein will debut a performance piece titled Hot Air and Rain during the opening reception, at 5:30 pm. View images from the opening reception here.